EMI 17219. JASON THE SCORCHERS. Still Standing. 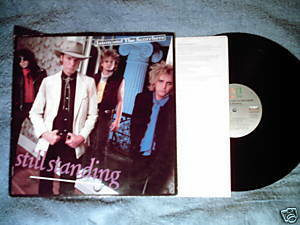 1986 LP includes Golden Ball and Chain, Crashin' Down, Shotgun Blues, Good Things Come to Those Who Wait. Band members are Jason Ringenberg, Warner Hodges, Jeff Johnson, and Perry Baggs. Country rock. Produced by Tom Werman. Vinyl is VG; cover with photos is VG with minor seam scuffing and corner wear; inner sleeve has lyrics.